Now that life has started to settle down a little bit after the arrival of the baby I've started to think more about the house and how I'd like it to look. I can't even begin to tell you how much I've missed lusting over home accessories, prints, throws and furniture! I love scrolling through Instagram looking at people's living spaces and imagining what our living room could look like with a bit of styling. I'm trying my very best to keep our lounge as baby-free as possible and as time goes on I hope it stays this way.. I want a room to escape to in the evenings that makes me feel relaxed and cosy.. even if the dining room is covered in dried up porridge, plastic toys and washing waiting to be hung up to dry! I want a room I can add nice accessories to and somewhere that I feel has a touch of our personalities. At the moment we've kind of still got a blank canvas.. the walls are rather bare, the bookcase needs replacing and we are in desperate need of a new TV unit. 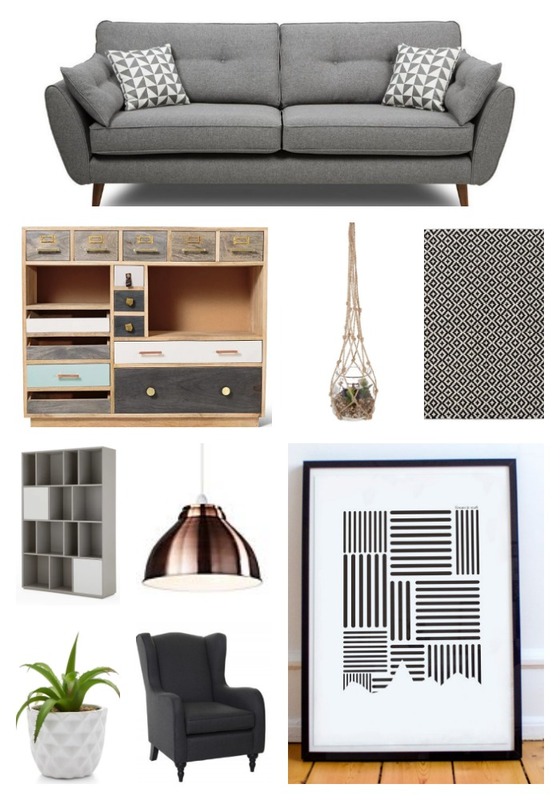 I've been lust listing bits and pieces for a while now and wanted to share a mood board on my blog.. maybe by the end of the year I'll have made some progress with it all... fingers crossed! 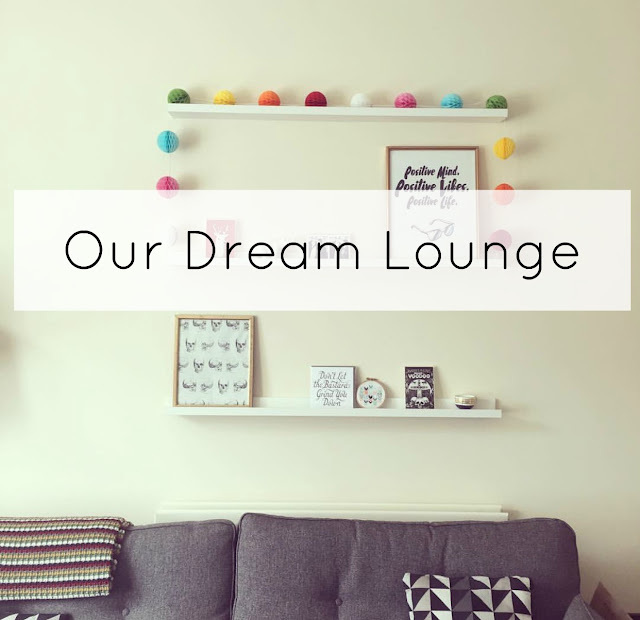 The only piece of furniture I love in our lounge is is our French Connection Zinc sofa so I'd like to find a few more pieces that compliment it and make the room feel a bit more finished. French Connection 4 Seater Sofa (DFS) £899- This is the sofa we already have in the lounge.. I love the simple design as its easy to fit into any space.. just change the throw cushions to match your colour scheme! Renee Wood Chest (Oliver Bonas) £650- This would be perfect to have our TV on.. I cant stand being able to see all the wires around the back of the unit we have at the moment. In this unit theres space for the games console we have and enough draws and sections to hide away bits and pieces we currently have on show. Macrame Rope Artificial Terrarium (New Look) £14.99- I'm crap at looking after real plants so this artificial terrarium would be perfect to hang up in the corner of the room... just a bit of dusting needed now and again! Nevio Tufted Wool Rug (La Redoute) £259- Ohhh I love this rug.. it would go with the sofa beautifully. Stretto Large Shelves (Made.com) £399- I'm a lover of organised pretty clutter; I've got loads of random antique pieces I'd like to display on this unit plus it would also look good with some storage baskets in to hide away some toys if needs be. Retro Celling Lampshade (Marks and Spencer) £49- A room isn't complete without a nice lampshade is it? This coppery one would be perfect to add a bit of shine. Scandinavian Minimalist Poster (Inky Gorilla) £6- Simple yet so on trend! White Artificial Cactus Plant Pot (New Look) £5.99- Again, love a good artificial plant to add a bit of green to a room. Jacob Accent Chair (FishPools) £399- I love this chair; I've always wanted an armchair to sit in and read a book.. simple things eh! If you'd like to have a browse through some more sofa's and armchairs then check out the range available at Fishpools here and here. Have you bought any homeware pieces recently? Where do you find the best bargains? *This post contains collaborative links but my selection of products is totally honest.